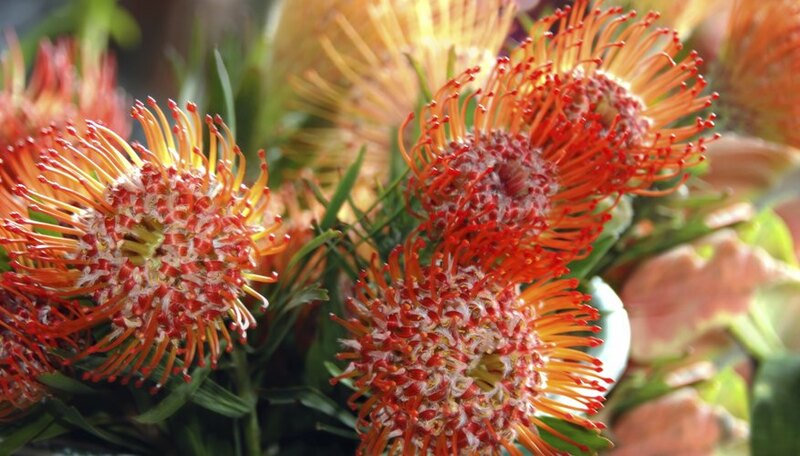 For big impact in a floral arrangement, include a large, colorful protea flower (Protea, Leucadendron or Leucospermum spp.). The exotic-looking blooms have a series of bracts surrounding a central mass of small, tubular flowers. You'll see them primarily in pink, red, orange and yellow, often with interesting color shadings. Native to the Southern Hemisphere, they're not widely grown in the U.S. The evergreen shrubs have leathery leaves that are usually dark green. Proteas grow as perennials in areas with mild winters, roughly U.S. Department of Agriculture plant hardiness zones 9 through 11, depending on species. Be patient when you put in the young protea plant, because the plants don't flower until two to four years after planting. The flowers appear at branch ends primarily in spring or summer, although some proteas bloom almost year-round. Use the plants as hedges, accent plants or as borders. Plant them where you can enjoy the blooms up close. You're only likely to find a few proteas for sale, either at a garden center or online. Oleander-leaved protea (Protea neriifolia) is the one you're most likely to find and it grows up to 10 feet tall in USDA zones 9a to 10b. Its flower bracts shade from deep to pale pink, with a fringe of black hairs on the top bracts. King protea (Protea cynaroides), which grows around 3 feet tall, is South Africa's national flower. The creamy white to red or pink blooms resemble artichokes. It grows in USDA zones 9 through 12. The 3- to 4-foot Pincushion protea (Leucospermum cordifolium) grows in USDA zones 10 through 11, with mound-shaped flowers that resemble pincushions on silvery-leaved branches. Good drainage is key to growing proteas. Grow them in a raised bed if your garden soil is clay-rich or tends to stay waterlogged. They also don't need fertilizing when they are first set out. Proteas naturally grow in soils low in nutrients, and the roots are efficient at harvesting what they need. Lightly prune proteas during their first year to shape the plants. Harvest the blooms regularly to encourage rebloom. If the plants need any additional annual pruning, do it right after flowering, before the plant begins new growth for the year. Soak the pruning shears in a solution of 1 part household bleach to 10 parts of water for five minutes, then rinse and dry them before use. Proteas are susceptible to root rot in wet soils, but generally don't have other pests or problems. In areas below USDA zone 9, grow proteas in containers so you can move them indoors for the winter. Choose smaller-growing species of proteas. Put the container in full sun in an area with good air circulation. Provide a well-draining soil mix and make sure the containers have drainage holes. Keep the roots cool. Don't allow the soil to become dry, but don't let it stay soggy. Cut protea flowers last longer if you remove leaves that will be below water and cut off the last 2 inches of stem. Use bleach water to prevent bacterial growth, made by adding 1/4 teaspoon of chlorine bleach to 1 quart of water. Occasionally recut the stems and change the water. Dry the flowers by hanging them upside down for two weeks in a dark, dry place with good air circulation. Alternatively, treat the flowers with glycerin to keep them supple. Put the cut flowers into a solution of 1 part glycerin to 2 parts water until little drops of glycerin appear on leaf edges, then dry them. Plants for a Future: Protea Cynaroides - L.